Welcome to the panoramic loge theater sea and land. Here are the keys ... Make yourself at home, enter! ... The 3rd floor, the sea is in your eyes, comfort your feet, for 2, 4, 6 people. You have a comfortable lodge for Earth shows - Wed. Want to attend the antics of the sea and flaming rocks? Going with fine sand a nice beach, which leads you to the coastal path? Take the elevator walk around, there you are. You've dreamed of Britain, will now have adventures in this bay that gives you the impression of being there for you, whatever your age, your physical condition. Get out, you will be customs, buccaneer, smuggler, browser, birder, watcher, artist ... or beach attendant. The beach of Trestraou, form a bay asked in a pink granite jewel of sublime beauty that the sea tease, caress and ruthlessly carves. This sea, in its great works is grandiose and lace that weaves a rare beauty. The sweetness in a glove granite ... When the Queen retires, she leaves you sandy beach. During his whereabouts, you can practice all sea sports, the 'pancake', to the board, sailing, balls, ball games, fishing, surfing, sandcastles for small builders and great. And what is that this evil legend of the time !!! Strangely, except the fantastic show of anger of the great Dame blue that rivals or sometimes combines with a friend or foe wind, the temperature is relatively constant, with no big difference throughout the year. It rains certainly knows but the rain to stop in the day and no more than reason rains in the month or year, just to keep you from 'cook' moderate climate, offer basically hugs the sun, good bursts of invigorating oxygen scented sea air. Setting quiet as the various activities of the sea, the promenade on the coastal path up ploumanach. I am old, and my mobility is reduced ...: When is comfort: the great outdoors comes to you. Practical and ideally located . : You have 74 m2, 2 bedrooms, large lounge, living room and a kitchen. You leave this cozy little nest and you at the foot of the building, the useful shops, casino to try your luck, a thalassotherapy center to replace health that stress has damaged the year. As for the car you can leave it in the garage under the building, it will be rested for the return, if you still want to leave !!!! And children, teenagers? off the beach games, off all water sports, of course, there are animations, it is less 'fun' on the southern beaches: But it's more Funtastique, more romantic and meeting rocks leaves room for the imagination. One does not conceal a privateer? A fairy ? Druids? The site is ideal for sea sports, adventure, adventures. Read the stories of our sailors and Brittany will call you to his heart that will knock on your door. Classified furnished 5 stars tourism. Tourist tax 0. 60 euros per adult / day, excluded children - 18 years. 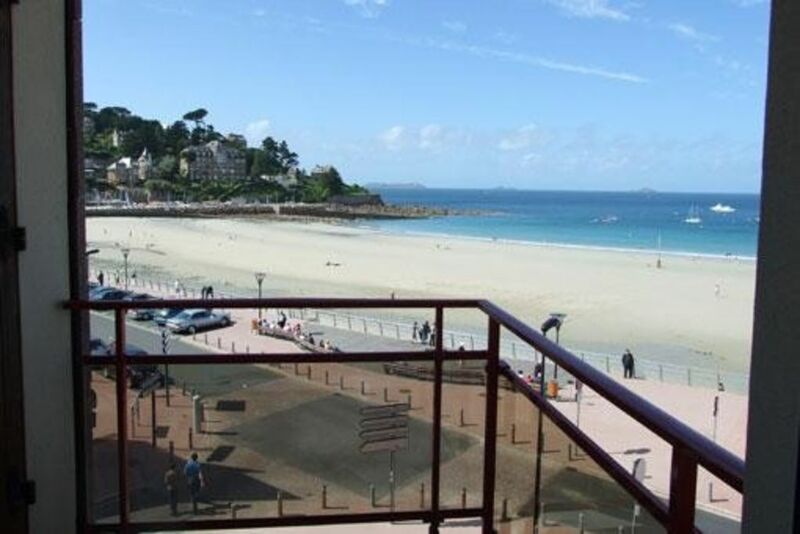 A comfortable, well equipped, unpretentious apartment with small balcony overlooking the beach. Linen not normally provided except at special request and at extra cost. Owners are helpful and have someone local to deal with any problems.